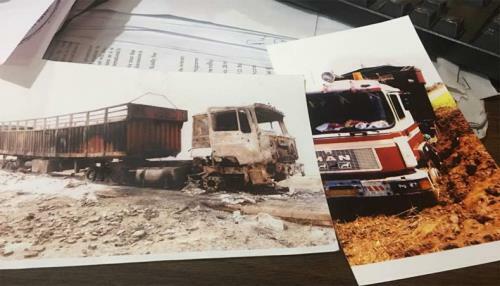 A Ghanaian transporter and driver, Abdulkareem Abdullahi, has lost his MAN Diesel articulator truck with registration number GR 2094 Q, to suspected Boko Haram insurgents in a village near Maiduguri, Nigeria, where they are very active. The insurgents allegedly torched the truck beyond recovery, a report about which he had already made to the local police and the ECOWAS insurance office in Togo. With the military deployed across Borno State, which capital is Maiduguri, he approached one of the stations to seek the assistance of the military as the vehicle was obviously was going to be left at the place overnight. “The soldiers told me outright that they would not go to the place because of the Boko Haram. I had nothing to do other than abandon the vehicle since there was alternative to that decision. When I returned to the place the next morning the vehicle had been torched with its cargo of cement, pipes and other items which were being transported to the Republic of Chad,” he said. Borno State, the state from which the Chibok girls were abducted by the insurgents, is an epicenter of Boko Haram activities where there have been many clashes between the military and the insurgents. According to Abdulkareem – a native of Wa in the Upper West Region – his vehicle was burnt down a few weeks after the recent abduction of some school girls, which made the headlines. A Nigerian police wireless message originating from the Superintendent of Police to the Commissioner of Police, Maiduguri, and copied to various locations on the occurrence after the transporter/driver had reported to the Mafa Division reads, “Grateful be informed that on 23/2/18 at about 1045hrs one Abdulkareem Abdullahi of Aboabo, Kumasi, Ghana Republic, came to the station and reported that on 14 February, 2018 at about 1500hrs while driving his vehicle – MAN Diesel with registration number GR 2094 Q – from Maiduguri heading to Chad Republic loaded with one thousand, two hundred bags of cement, two hundred pipes and five jeep tanks. On reaching Kaltaram village along Mafa-Dikwa road, the vehicle developed a mechanical fault. Ghanaian registered vehicles under the ECOWAS protocol ply Nigerian routes, especially in the Northern routes, most of them Kumasi-based drivers. The burnt truck is insured under the ECOWAS brown card insurance policy.